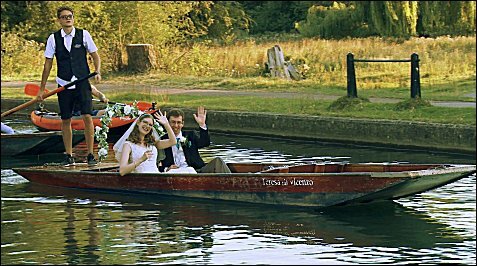 "We loved the way we felt so at ease with the videographers. During the day we didn't even notice they were there.The video is fantastic! It really reflects our likes and interests." "Thank you so much, that was a quick turn around! We have just watched it and we LOVE it! We hardly noticed you were there so we can't believe you captured all of those amazing moments! We can't thank you enough and will be recommending you highly to our freiedns and family!" 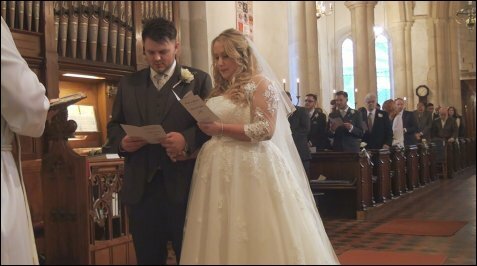 "Thank you so much for our wedding video, You managed to capture our special day, we have loved watching it and sharing it with our friends and family. It was great to meet you both, you are clearly very skilled in what you do. I will be recommending you to my friends!" "Sorry this is a late email but I just want to let you know the video is fantastic. We could not have asked for anything better. You and your team have done an mazing job and we could not have been happier with the way it turned out. The part with the memory table really choked me an my darling wife up as you got the music spot on for that part. Thank you from the bottom of our hearts and we have got a video we can keep for the future family." 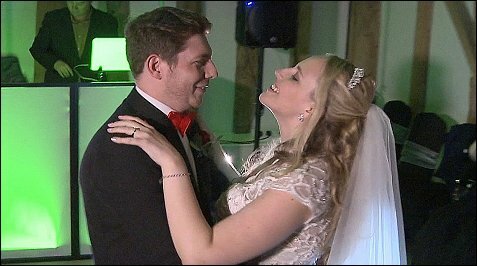 "Amazing video, such a happy bride.. everything was perfect. Thank you so much Dave, you have done an incredible job." "Wow.... Last night we watched our DVD and it is perfect!! We can not thank you enough... We LOVE how involved you made our dog, Ralph, it is so funny! And all the angles you got are just incredible as we did not even notice you there throughout the day! We have already passed your number on and will continue to do so! Thank you again for all your hard work. We couldn't ask for anything more! Kind regards, Mr & Mrs Evripidou. What went well: "Lovely people. Didn't really know they were there filming." What needs improvement: "Nothing :-) - maybe the option to have some of the out cuts." "Thank you for all your work. It's amazing. Couldn't have wished for anything better." 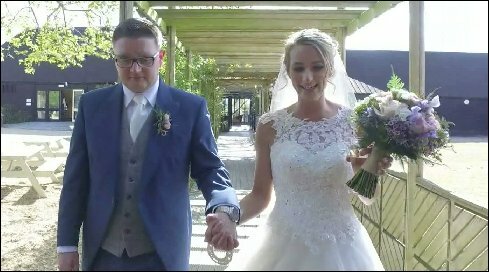 "We just want to thank you for the brilliant video you have done for us for our special day, we can't wait to show all our family & friends. We are so pleased we got the video to keep to watch back. The music & the way the video has been put together is beautiful we are so happy." "We love the video, thank you very much for doing such a good job. Will recommend both of you whenever an event comes up." "Everything went well, they were lovely! We didn't even know they were there. I would recommend to everyone." "The team were amazing on the day and the video is perfect! Thank you so much! 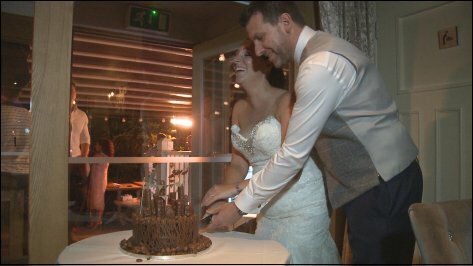 The video is so lovely to look back on and remember our special day! We have already recommended others to you who have booked!" 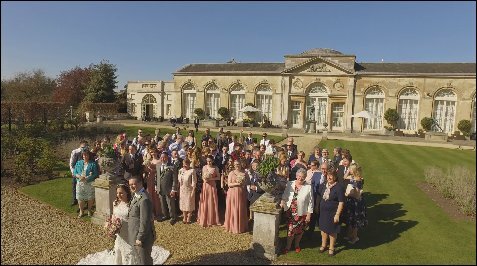 "Impeccable preparation; very helpful when discussing what we were after; very professional and discrete on the day; resultant DVDs were very professionally done and importantly were a good chronological record of the day." 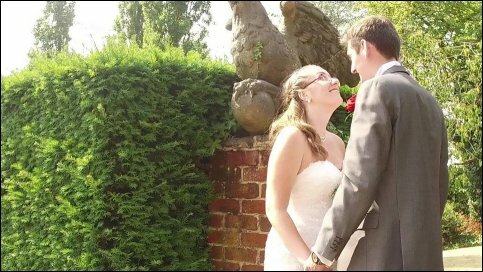 "I wanted to write to say thank you so much for your wedding video which we have just finished watching. It is absolutely fantastic and we are so very pleased that we decided to go ahead with you guys." 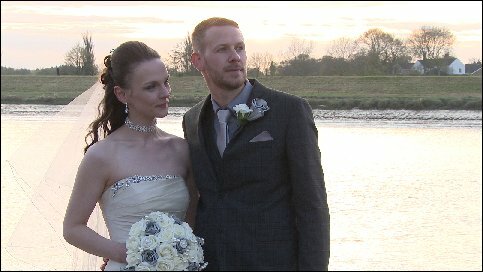 "Over the moon with the overall production of our wedding video! It's beautiful I couldn't be more happy! Thank you so much will definitely recommend you in the future!". "Thank you for the video, it was great to watch. Very unintrusive, didn't know you were filming most of the time." "Wonderful D.V.D. to remember our special day". "Excellent editing - managed to capture the essence of the day. Dave and Isabelle were very friendly, professional. In a good way hardly knew they were there. Very happy we had the film done." 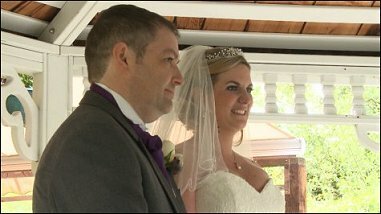 "Just watched our wedding video,- so pleased with the whole thing. Dave and Isabelle were so professional. Definitely recommend Northill Video. 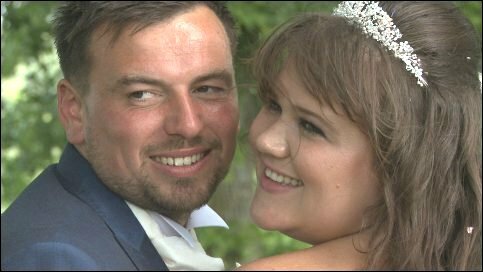 After an unexpected turn to health one week after my wedding watching my video has just reminded me of the brilliant day we all had." "You guys are so professional! Our video is amazing! 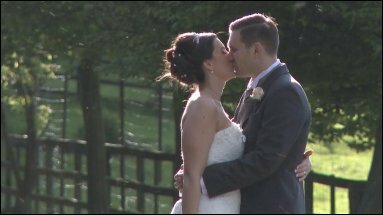 We can't thank you enough for capturing our day so beautifully and so professionally. Marryoke is such genius! Hilarious and such a hit with all our friends and family!" 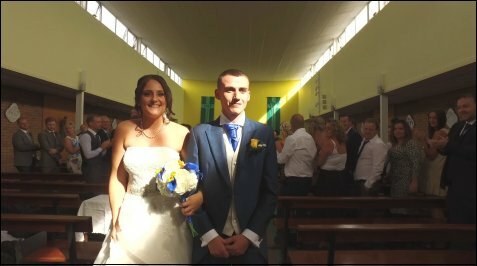 "Huge thanks for your fast delivery of the DVDs we watched as soon as we got them and it really was like reliving the day all over again, we can't thank you enough for the effort you and the team put into the finished product! On the day we hardly noticed you were there, so how you got some of the footage you did is down to your high professionalism. Once again thank you and we won't hesitate to recommend you to everyone." 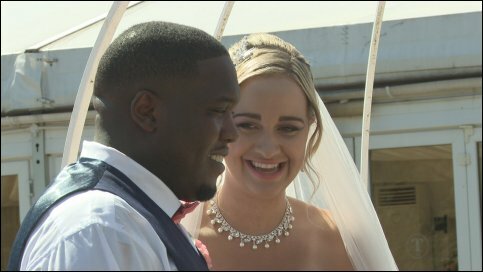 "We received our wedding video today and have just watched it. We love it!! Thank you so much, you captured it perfectly. We are so happy with it." "Magic moments caught without cameras getting in the way. We especially love the short edit - it's so well done! Thank you so much! You were endlessly patient, responsive and professional - before, during and after the day. We were kept informed and the dvds came so quickly! "Now that we are back from honeymoon, we would like to say a heartfelt thank you for filming our wedding. What an absolutely perfect way to look back on the day and capture things ordinarily we didn't see i.e., guests arriving (I missed this part) and me arriving (everyone misses this part as you're inside!). I loved the style and the way the film was edited. 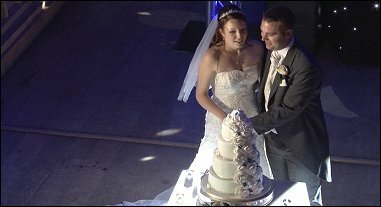 I would not hesitate to recommend you to anyone that was thinking of having their wedding filmed. It was something we questioned doing but am so glad we did. The whole filming process was natural and unintrusive, even our vicar approved! Thank you to you all 5 stars!" "Absolutely fantastic guys very professional and great attention to detail thank you very much." 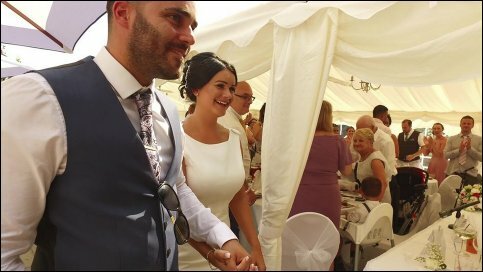 "At no point did us or any of our guests feel that the videographers were intrusive they fitted in with us and our guests. 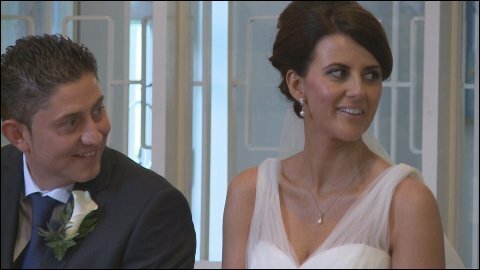 Fantastic video and a perfect reminder of our special day." "Very professional and discrete. All expected content and much more". "Professional from start to finish. 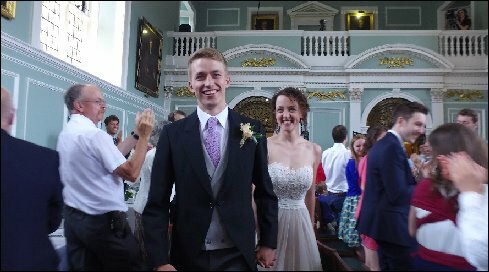 From the ceremony to the end; you wouldnt even know you were there and you capture the moment perfectly. It brought back a day that we will never forget and can relive over and over again. Marryoke: Looking back, you guys must have been very patient with our guests as more drink was flowing throughout the day. Thank-you it was a great laugh and we cant stop watching it Great fun. Quality of finished dvd's fantastic, we would recommend you to anyone in the future." "Very professional from start to finish. Quality of finished dvd's more than we ever expected. Would recommend you to anyone in the future." "We were really impressed with the way you became invisible during the day, very professional. 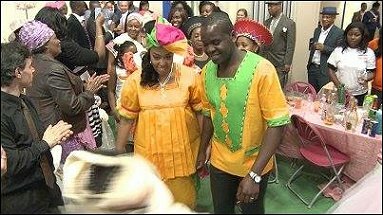 Blending in without us realising you were videoing the event." "So happy that our very intimate wedding was captured so well." "Hi Dave, we have received the discs, thank you. They look brilliant and the way it all comes together is fantastic! 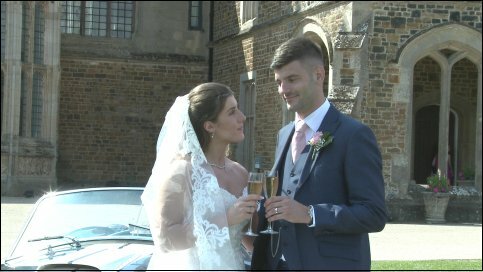 Thank you again, Micha"
"(Now we have enjoyed our honeymoon) We wanted to say a massive thank you to the team at Northill, Our wedding video was amazing and brought back the emotions from the day when we watched it. So beautifully put together and everyone was laughing and crying all over again! ?? Thank you so so much for coming out to us in Petersfield." "You were very professional and helpful all day. Most of the time I didn't even realise we were being filmed, which was lovely. The editing of the video was superb and we really do have something we can treasure forever." "The film team were excellent! We forgot they were there. Some of the shots they managed to get were great! It was lovely to see the finished product! We loved seeing the shots from the morning when we are getting ready. Really lovely. We honestly can't fault Dave and Northill. Fantastic team. Great support and advice from start to finish. All our friends and family were impressed with the DVD too!" 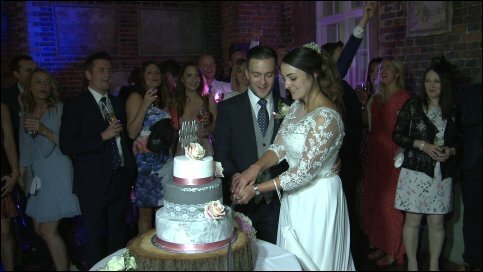 "The whole day was beautifully filmed - from the setting, the ceremony, the wedding breakfast and the speeches to the couple's arrival by punt at the evening reception with the cake cutting, first dance and evening entertainment. The atmosphere of the day was captured perfectly. The use of multiple cameras worked really well. The cut away scene during the speeches and the beginning and end titles were lovely. 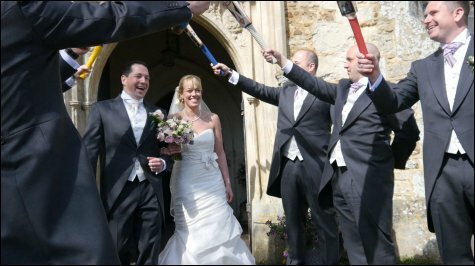 Excellent pre-wedding preparation by Dave - always easily contactable and quick to answer any communication or query. Highly professional and reliable team. 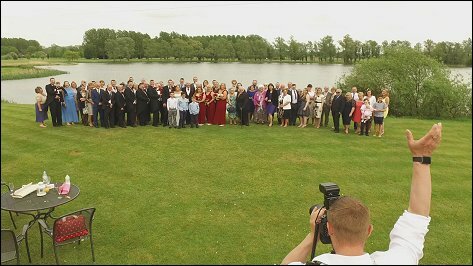 Very unobtrusive on the day and very efficient production and delivery of the wedding DVD`s. Would highly recommend this company!" 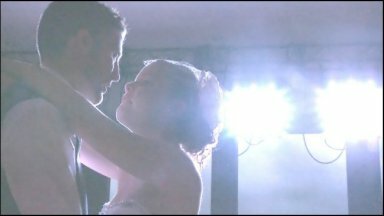 "We are absolutely thrilled with the video of Livi and Seth's wedding. It captures the happy relaxed day that we had perfectly and even the packaging is lovely. We have so enjoyed watching it, rather a lot of times already!! Thank you again for giving us such a professional service that we will treasure for always." "Arrangements and communication very good. Punctual and friendly staff. Quick delivery of our video. It was such a wonderful surprise to have them hand delivered just before we went off on Honeymoon. Very cost competitive. Would highly recommend. Most of the time you dont know they are there, there just blend in to the day which makes you feel comfortable." "Thank you for a superb video,- we didn't know you were there! We loved the slow motion of petals falling!" 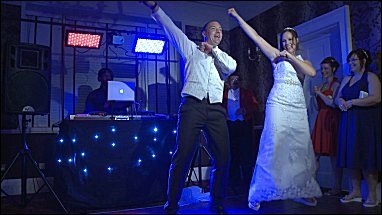 "Fantastic and great value account of our special day. Includes close ups of every guest at some point during ceremony which is great. 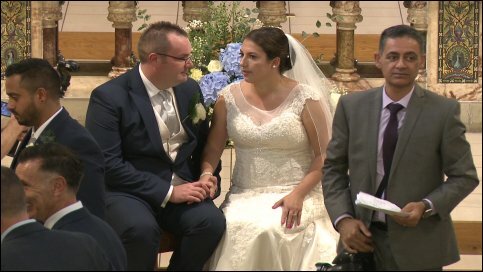 Love the slowed down shots and some of the funny edits during the speeches! Barely noticed you on the day, you blended in nicely." "The package arrived today thank you, have watched the concise edit so far which is fab! 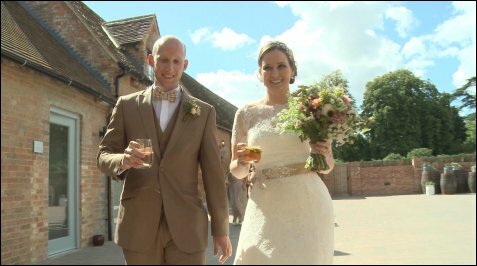 Thank you so much for capturing our day so beautifully, it's all a bit of a blur so it will be fantastic to be able to watch it all and see all the bits we missed on the day. We will certainly recommend you to anyone wanting a video." "You were totally professional at all times. Great communication made from start to finish. We are so pleased and delighted with the video." "Wow! 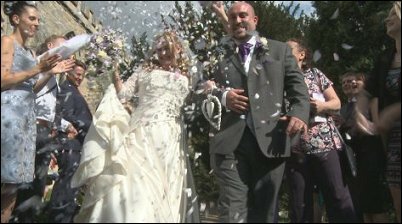 All videographers were so discreet we hardly knew they were there, this allowed them to capture some great moments. Really loved our DVD/BluRay and it will be cherished for years to come." "You did a fantastic job, capturing every moment and editing it in such a smooth beautiful way. 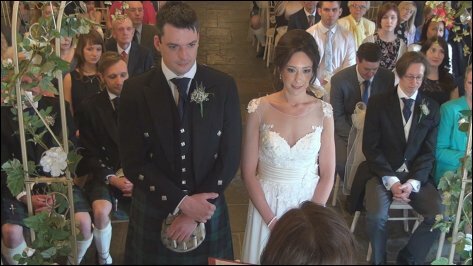 We will treasure the video forever, it is so lovely to be able to relive our special day as well as seeing all the bits we may have missed on the day. Thank you so so much for a brilliant job." "The video caught people's reactions which we would never have get to see otherwise. It was brilliant that we didn't really even notice that you were there (in a nice way!) The video was everything we could have asked for! Amazing value for money and it perfectly captured all the important parts of our day! Thank you!" "We watched the dvd last night it was brilliant thankyou very much. My mum loves it even so much she watched it twice! Her main attention on the day was focused on baby Mollie so I didn't have too, meaning she didn't see much! We are all amazed with how you captured ours special day so perfectly. Thankyou again for your excellent service I will be sure to recommended your company to friends!" "Hi Dave, video is brilliant, you both did a great job. Thank you so much." 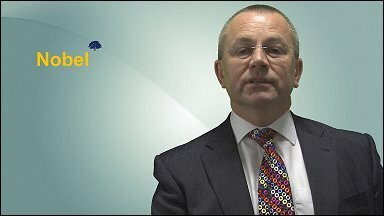 "The video was perfectly created, the professionalism of Dave and his team was brilliant. You were very receptive of our needs and communication with Northill was quick and stress free. 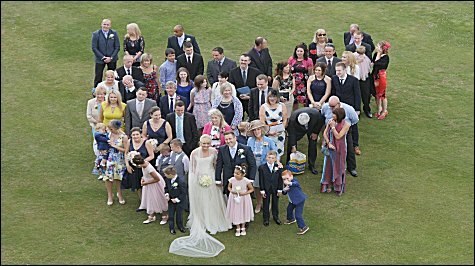 Great service and value for money, You have captured our memories perfectly." 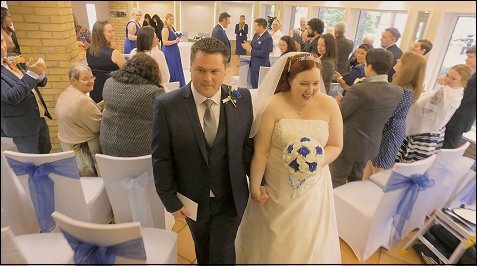 "We would like to thank the whole team for creating such wonderful memories of our special day. 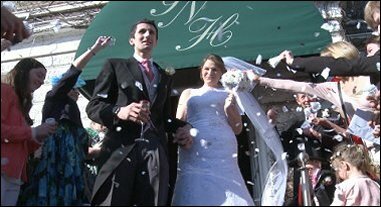 The service provided was superb and I highly recommend Northill to anyone. Not only did they work well on the day but leading up to our wedding, Dave and his team kept in touch going over details to ensure all went to plan on the day. Both myself, and my husband felt that we could not have asked for more. Even when the DVDs were produced it was done with fantastic quality and within a very quick time." "Cannot recommend Northill highly enough. You listened to exactly what we wanted and were so responsive and great to deal with. We felt in really capable hands and the results were just superb. 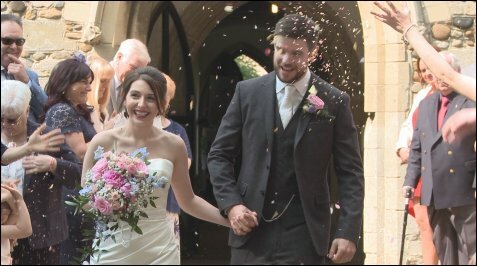 [...] We are so appreciative of all your hard work and are so happy with the memories of our wedding that you have captured so beautifully and that we can treasure!" 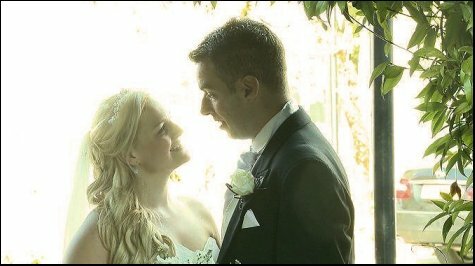 "Jessica & I would like to stress how impressed we are with our wedding DVD it exceeded all our expectations it is truly fantastic, the way you have presented it & put it together is really something special for us. 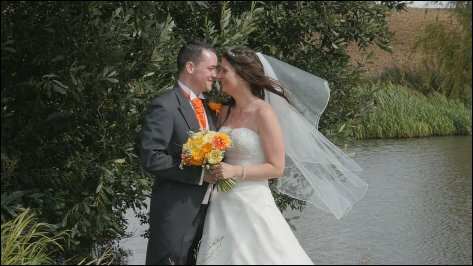 Not only that, the way you were on our day,- blending in & being so professional & working so well with our photographer was really good, you guys should give yourselves a pat on the back because you're all very very good at what you do offering us amazing value for money too, you will be getting a high recommendation from us both." "You really listened to what we were looking for and added some really fun extra touches on the video. We just want to say thank you so much and we have already recommended you." "I really enjoyed the funny quirky bits they were just brilliant. I thought you captured the day including the mood beautifully. I also felt you managed to do it all without being intrusive into our celebrations. I wouldn't hesitate to recommend you to friends." "Very unobtrusive, you forget you are there, so don't feel embarrassed about the cameras being there. 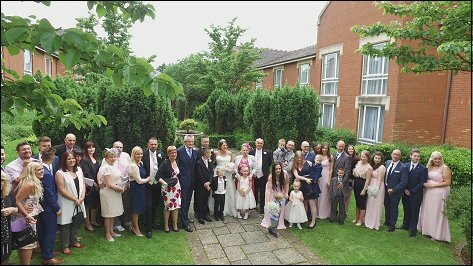 100% recommend you to my friends and family, have such a lovely momento of the evening, priceless." "The whole day was perfect. You did not realise you were there at all. For the cost of the day and the amount of work you guys did it was serious value for money. You captured everything we wanted. The songs that we chose were implemented by yourselves on the DVD perfectly. The DVD has been watched countless times already. It is a great memento of our day and we can not thank you enough"
Just wanted to let you know that the video, so far, has gone down really well. 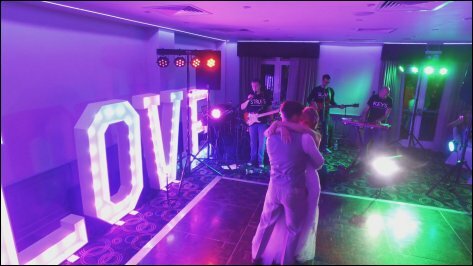 The feedback is great and we've had suggestions from people who didn't even attend the wedding that you should advertise this sort of work for weddings in the future. You did an amazing job with what you had to work with and everyone is really pleased. 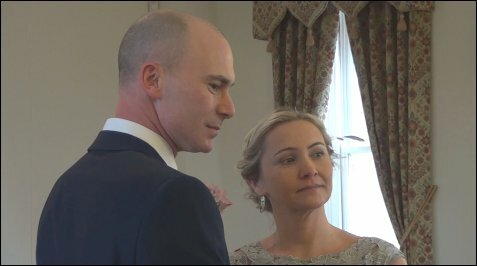 Paul and I are extremely grateful, as are the bride and groom. 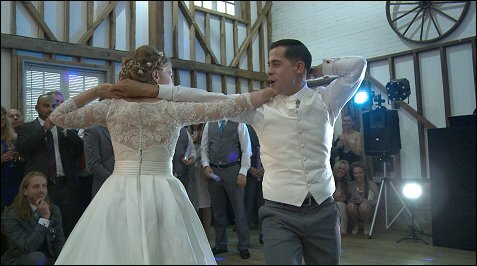 Their First Dance surprised everyone by changing to a series of well-executed choreographed dance moves to an amazing variety of dance tracks! 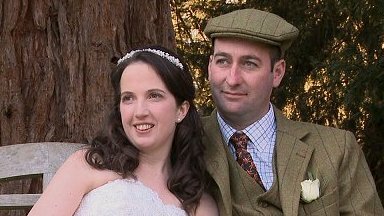 "Dave and Isabelle were brilliant and supplied an amazing product." 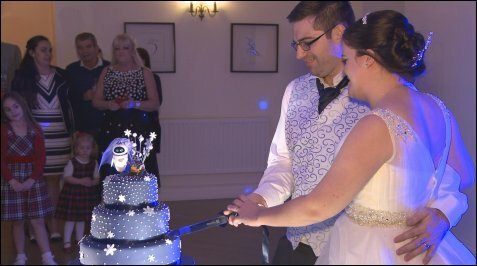 [...] At the start of the wedding planning I must admit I over looked a videographer as an extra expense I couldn't quite afford. I can now honestly say it is some of the best money we spent on the day and we are both so happy that we sought your services. No picture or memory can properly capture the buzz in the room and laughter in the speeches and repeat it again and again." Lethabo Jane Matjeke who placed the order was kind enough to comment that we were "great videographers" and that we had covered all the important parts of their day which had a South African theme. 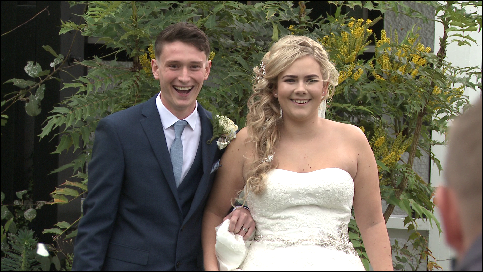 "Just wanted to say a huge thank you for the fantastic video of Sarah and Pete's wedding. The four of us watched it on Wednesday evening and then replayed it because we loved it so much. 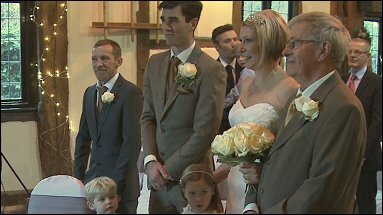 We watched it again last night with Anna our granddaughter and who was one of the bridesmaids and she loved it. Every time we watch it, we see something we missed the previous time." 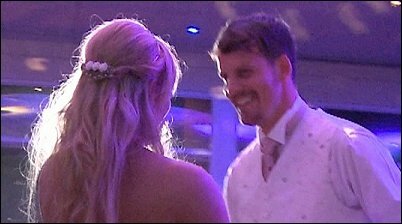 "Watched our Wedding DVD at the weekend and both Caroline and I are very pleased with it all especially as we hardly gave you any notice!! 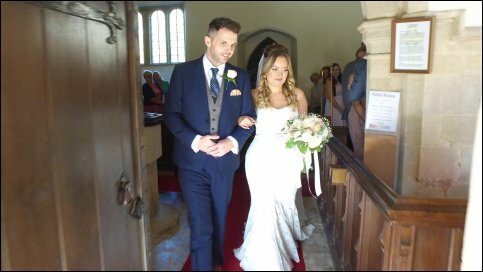 - on another note my daughter is getting married next year (more expense) on the 24th May and I know she is thinking of having her day videoed, so hopefully will be in touch.."
"From start to finish Dave and his team were complete professionals! 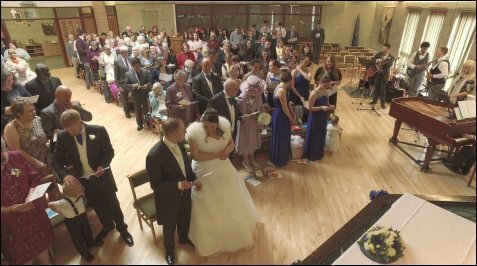 The wedding service at church was captured brilliantly with the bride & groom (ourselves) and family members captured wonderfully. 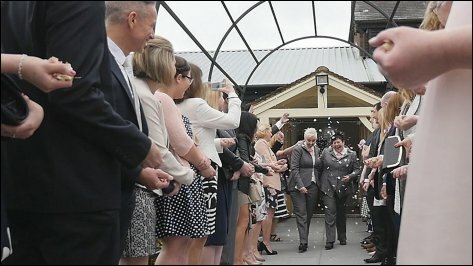 I (Donna) particularly loved the moment I walked down the aisle with my Dad, this was filmed perfectly. 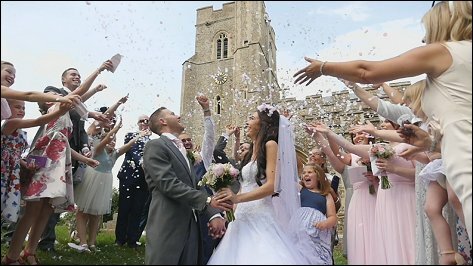 The church was an important part of our wedding day and we are very pleased with how we can now look back and see those special moments captured!" 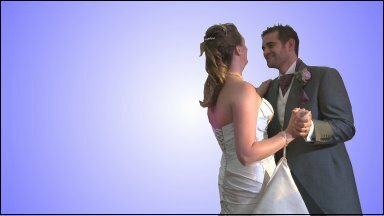 "the video was wonderful, great quality, really pleased with it, thank you"
"Professional team, thorough planning, great 'can do' attitude at short notice! Dave and his team have been great. 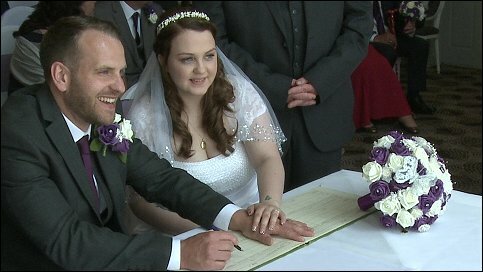 We contacted them at short notice to video our wedding, which was a fab, but busy day! They were professional, calm and did a great job. Would definitely recommend them!" 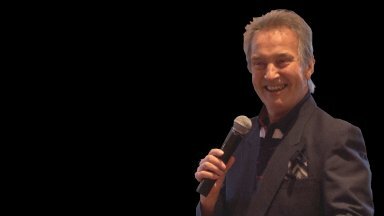 The 80th Birthday Party of showman George 'Dido' Walker, near Luton in Bedfordshire: "We loved the DVD and uncle (George) loved it as well". 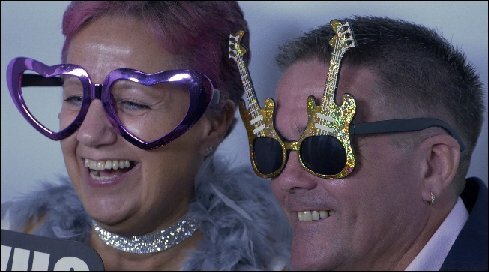 "We would like to say how fantastic the video was, we absolutely love it!" 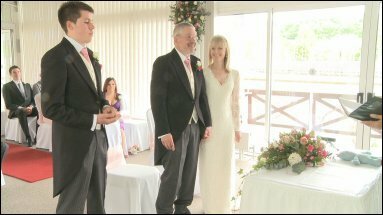 "Dave and his team were great and really captured the essence of our special day." A D.V.D. for a sports event in support of Tesco's charity,- Diabetes U.K. "thank you so much for the DVDs: - they look fab :) exactly what I wanted! Can't wait to show everyone - thank you ." A presentation for the Nobel School in Stevenage for use on their website: "I am seriously impressed by the quality of the recording and the speed of turnaround." "We were extremely happy with the service". "Thank you for the DVDs. I have loved looking at it (several times). I particularly love the ending with the lanterns." 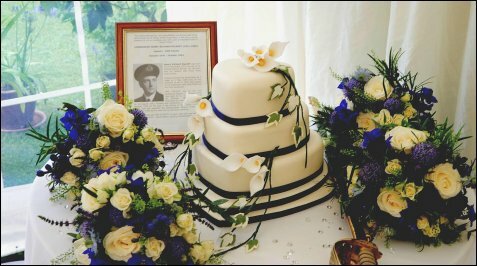 "Everything went really well; the weather wasn't great but you would never know when you watch the video :-) The service we received was brilliant - (they) did a brill job and were not invasive at all, in fact we didn't even know they were there! 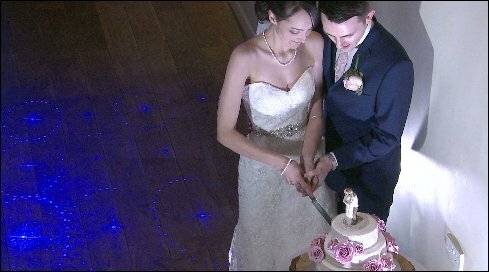 The lighting in our venue wasn't brilliant but the video still looks really good :-) "
Sarah and George were very lucky with the weather as can be seen from this frame: they commented: "good recording of the ceremony and speeches. Told 'story' of the day well. Did not feel conscious of being recorded." 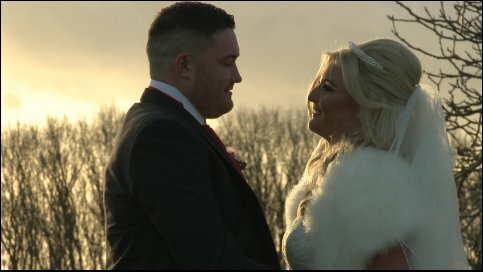 Just watched our wedding video and absolutely loved it!! Amazing reliving the day and memories and really made us emotional. 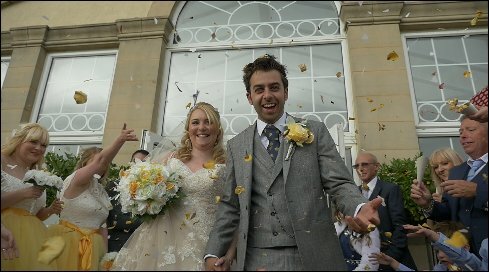 The music fitted sooo well and the ceremony and speeches were so clear. Thankyou soo much, I can honestly say we didn't notice you were there, yet you really did capture all the magical moments. Thankyou! The video was received safe and sound. It is amazing!! Everyone has been very complimentary about it. Thanks again, the video is a great memento of the day. Especially, for my grandparents who couldn't be there. Cheers, Jason. We have received the DVDs. Just wanted to say thank u the film is amazing captures the day beautifully. All our family are loving watching it. Many thanks.